» A roadblock on Columbus N.E. A roadblock on Columbus N.E. That’s the way the rail crossing on N.E. Columbus looked on Thursday. As far as at-grade railroad crossings go, the one on Albany’s Northeast Columbus Street wasn’t exactly a busy one. Now it’s even less busy because the street has been closed where it crosses the track. This past week, sturdy wooden posts were put in to hold the street-closing barrier, though on a bike I could still get through. The crossing lies on the Water Avenue rail line owned by the BNSF and operated by the Portland & Western. It was being closed as part of a deal the city of Albany made with the ODOT Rail Division several years ago. Albany’s city transportation expert Ron Irish reminded me of the details. 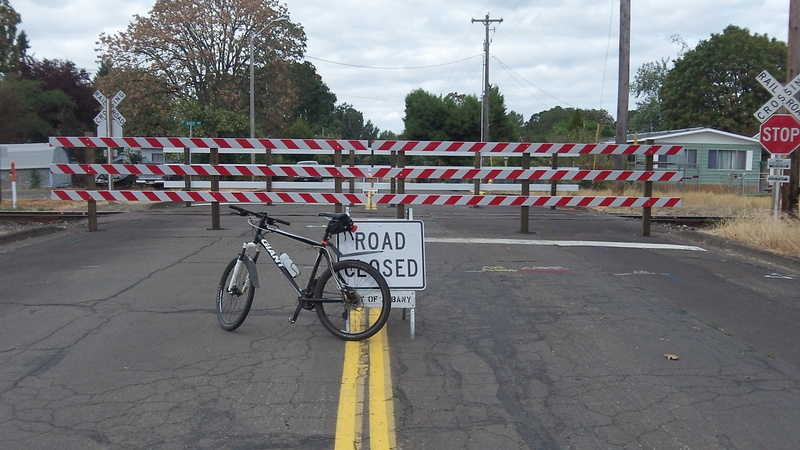 In order to allow development of the former industrial property between the Water Avenue rail line and the Willamette River, ODOT Rail would require automatic gates at several street crossings at a cost estimated at $250,000 each, making development just about impossible. The city council agreed to close some crossings in order for ODOT to make federal funds available to pay for gates at others. No more closures are in the works. 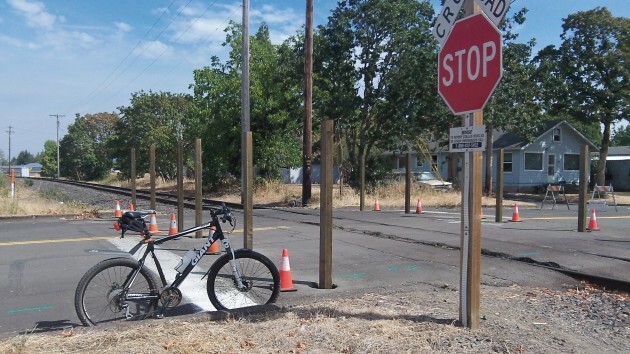 And presumably, if or when this segment of the old Oregon Electric rail system is ever abandoned, as has been thought about from time to time, all those streets could be reopened. As you can see on Aug. 31, the Columbus Street closure is now complete. I live the next block up and was wondering what was going on with that. It’s one of the ways in and out of my neighborhood around the tracks. So thank you for looking into this. Although the neighborhood isn’t busy by any standards, since the closing, it’s cut back on people driving from Columbus, turning down First, and speeding the entire stretch to Geary Street. Until that old, 19th century land give away for R/R’s is changed it’s still “We the Public” are crossing their “Private” land. So the R/R’s can prevent, charge, delay, etc our access & crossing ability! O.K. R/R’s, where is that viable public transportation system “We the Public” were to get in exchange for all that vast land you got? ?…J.E.